Serena Ivaldi joined the IAS group as a postdoc in May 2014, to work on the CoDyCo project. Since November 2014 she is permanent researcher in INRIA, France: please visit her new webpage! Before coming to Darmstadt, she was postdoctoral researcher at the Institute of Intelligent Systems and Robotics (ISIR) in Paris, France, from 2011 to 2014, where she worked with Vincent Padois, Olivier Sigaud and Mohamed Chetouani. In ISIR, she was in charge of two iCub platforms. She was key investigator in CoDyCo, co-PI in project EDHHI and coordinator of the experiments in project MACSi. Serena did her PhD at the Italian Institute of Technology (IIT) under the supervision of Giorgio Metta. 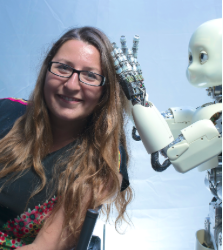 In IIT she worked in the Robotics, Brain and Cognitive Science Lab, directed by Giulio Sandini, and worked in the team of Francesco Nori for the iCub's dynamics. During her PhD thesis and M.S, she also worked at the Neuro-Optimization Complexity and Control Lab at the University of Genoa, studying neural networks and stochastic optimal control. Her research is centered on robots interacting physically with humans and environment. She is also interested in developmental robotics, blending learning, perception and control, and is now starting an activity of assistive robotics in Inria. She co-organised a Special Issue on Whole-body control of contacts and dynamics for humanoid robots, in the Autonomous Robots journal. For all publications please see the page on her new website. Serena organized with Jan Babic, Mike Mistry and Robin Murphy, a Special Issue on Whole-body control of contacts and dynamics for humanoid robots, in the Springer Journal Autonomous Robots.